They say imitation is the sincerest form of flattery but I can say with absolute certainty it 100% is not in this case. What I recently discovered with regards to having my written work plagiarised was that it was too close for comfort. It was recently brought to my attention that a number of my blog posts had been copied by another blogger whom I've actually met before at an industry event. I've taken photos for her and she even DM'd me on Instagram to meet up to shoot outfit pictures on more than one occasion. By copied I don't mean taken inspiration and putting your own spin on it which as bloggers we all do from time to time. I mean outright word for word copying. An actual real life COPYCAT. When the posts that had been copied of mine were brought to my attention I had to do a double-take. My words closely followed by a picture of a girl that was not me. At first glance, I looked and thought hold up did I insert the wrong picture. Surely not?! When I say this was a copy and paste job, I am by no means exaggerating. I've included examples for you below. Spot the difference, oh wait you can't. You want to know my initial reaction? Pure anger. The type of anger where you see red and want to throw something at a wall. I was so angry to the point that I wanted to scream. Transitioning into blogging full time, you could say I've had to work my arse off to get where I am today. It by no means has been an easy ride despite some thinking I am a lady of leisure with a show and tell lifestyle. A string of late nights, knock backs and often feeling deflated on countless occasions are just a number of things I have had to contend with. I absolutely LOVE my job and am so fortunate and lucky to be able to do what I do full time. I know so many girls would kill to be in my position so I truly am grateful but equally I have worked hard for what I have achieved too. So when someone outrightly copies your work and tries to pass it off as their own, it basically feels like taking a slap in the face but essentially it's plagiarism and a breach of my copyright. After getting over the instant shock and anger, I knew that something had to be done. I'm not one to name and shame but I felt the need to call this girl out on her actions. Not only had she done this to me but also my really good friend Sophie Milner. We both took to Twitter yesterday. You may have already seen the thread and it has since been revealed that the blogger in question has actually plagiarised other bloggers in the industry. It's disgusting, appalling and shocking on so many levels. I cannot believe that someone would go to these lengths, I mean where are her morals? I didn't name and shame (even though others said I should) but the blogger in question rather than message me and apologise has since blocked me on Instagram, deactivated her Twitter and privatised her blog. Blogging has become such a competitive industry that it often feels so hard to stand out. I also pride myself on my honesty and I only post things on my blog that I am truly proud of. 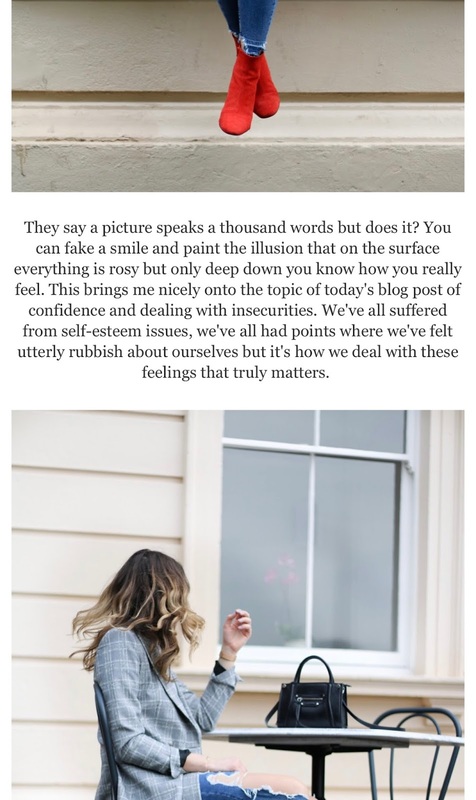 My blog posts take me hours to create and more often than not are personal posts that come from the heart where not only do I convey my deepest feelings and insecurities that I often have to pluck up the courage to post but also at times make me feel extremely vulnerable. So when someone goes and copies them without even using a thesaurus, I'm left thinking 'are you actually ok Hun?'. Don't think for one minute that you can pass off my work as your own or worse take credit for it. Ballsy or plain right stupid? I'll leave that up to you to decide. Whilst I may not be able to do much legally without incurring massive costs (yes I have enquired) I'm not going to give up without a fight. Metaphorically speaking. 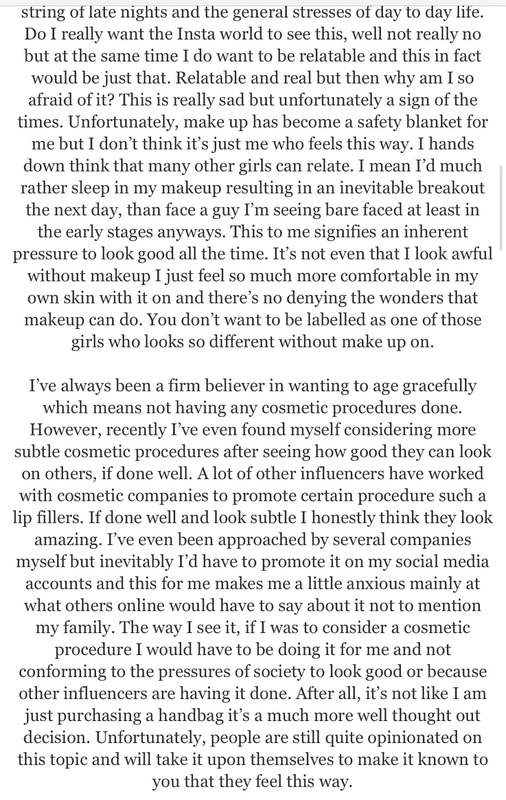 This is exactly why I took to Twitter and after doing so reluctantly I am so glad I did because it's actually been revealed that this has also happened to other bloggers in the industry and it's not ok. I've often been called a push over and I can hand on heart say that I don't have a single bad bone in my body. I was actually deliberating whether I should write this post at all, let alone publish it because I was worried it could potentially backfire on me and essentially be horrible to someone else. At the same time, I know right from wrong and am certain that I would never dream of doing this to another blogger. It's like girl code where you don't go near your best friend's ex even if she's completely over it. You just don't do it, full stop. However, in my eyes this is all kinds of wrong. If you cheat on a test in an exam you'd be punished for it, if someone copied an editors work they would be penalised with plagrisim so why should it be any different for me or bloggers alike? It's not just me who has been affected by this either. One of my closest friends Sophie Milner has also had her written work copied on more than one occasion by the same blogger who copied my posts. If you're reading this and thinking I'm being slightly dramatic then you'll never understand 1) how passionate I am about my work and 2) how much time and effort goes into writing anything I post on this platform. I feel cheated, disgusted and ridiculously angry all intertwined into one and as you can imagine that's a lot of emotions to have at the same time. I don't mean to play the victim card here but I'm simply trying to make others understand how this has made me feel. It still shocks me to the core that someone thinks it's ok to outright copy another persons work and pass it off as their own. I mean how could anyone really be that stupid?! I think any other blogger who knows what is involved in creating a written article they are proud of will know exactly the emotions I am feeling right now and also how shocked I was to discover this too. I actually have a reader to be thankful for because it was indeed this person (whom I will not name) who brought this to my attention and clearly identified my writing style to the blogger that had copied me. I'm so sorry that someone has been copying you! Of course it's one thing to take inspiration from someone it's a whole other thing to blatantly copy!! Of course our industry is competitive but I wish we could support one another more and help each other grow as our industry grows instead of bringing each other down and copying! Sorry this happened to you Gemma. This is such an important post.You're such an inspiration to so many people. Keep up the great work! I saw this whole thing play out on twitter and I'm honestly so shocked people are doing this. It's so unacceptable. In school legit one of the first things they teach you at GCSE/A Level is that plagiarism is completely unacceptable. It's treated so seriously. Just because this is a non-academic context, that does not mean that this is any different. I'm sure she is not a bad person and this is coming from a place of envy/admiration, but you have to be, at best, extremely naive to believe that copying like this is ok. So good you wrote this post to bring light to this issue! I'm so sorry this happened to you. I know what it's like to be outright copied too, so I understand how you're feeling. I'm sorry this has happened to you lovely! I love your work and it is a real shame some people can't seem to be creative enough to come up with their own ideas. I'm so sorry that you've had to go through this. It really is a shame. 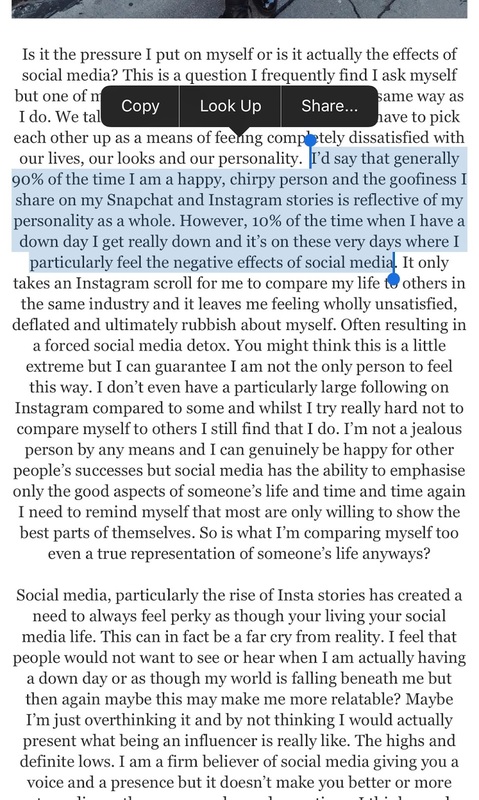 Great post Gemma. There is no excuse for plagiarism. Period. It is cheating, it is the theft your work, it is a breach of your copyright under law and for the person plagiarising your work (and that of the others) shows they've a complete lack of imagination, education and originality. It also shows incredible naivety that some people think they can get away with it - and sometimes even get paid for stealing another person's creative work. While fellow bloggers been outraged - and rightly - the fact that others fail to understand the seriousness of copying someone's original work, implies they are thick. It is also morally abhorrent to try and copy a style or look, but that drifts very much into a grey area. People often say, 'well it's fair game it's on the net'. That is untrue. Whether the work is in a book, magazine, on TV, on film or on the internet, it is still protected by copyright, and sometimes you have to stand up and be counted and defend that copyright.